This beetle drawing is a little masterpiece of pencil work by Sophie G in S3. This is the first initial drawing for her National 5 design unit and is an investigative drawing looking at form, texture and pattern to create a jewellery piece inspired by the insect. Sophie had worked on the drawing for a number of hours over a period of a month, but I’m sure that you agree that it is entirely worth it. 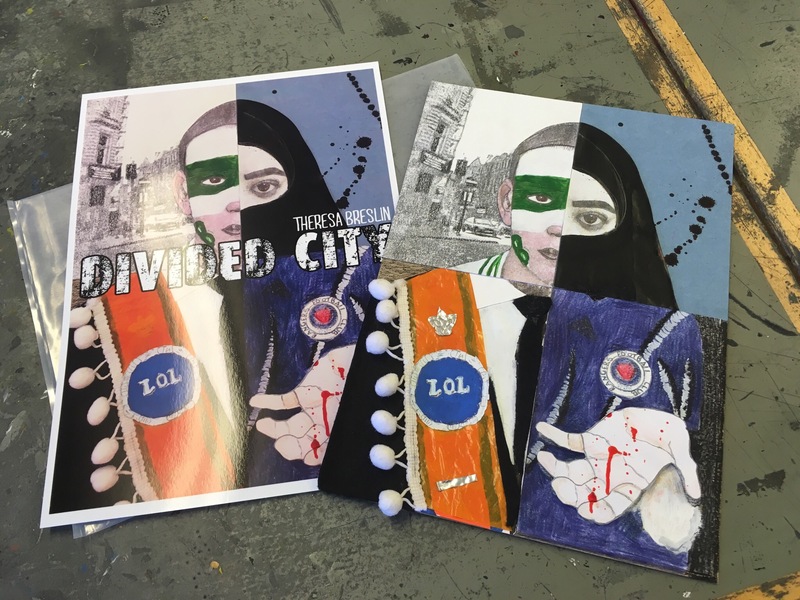 Evie & Maria’s (S2) book cover design was a runner up for the Scottish Book Cover Competition 2016-2017. I love how they’ve bisected the cover, showing different characters from the book. Shannah’s (S6) photo cover of a frozen spider web and Niamh’s (S6) watercolour painting also received recognition for their entries. All four girls received book vouchers and a certificate for their skills. 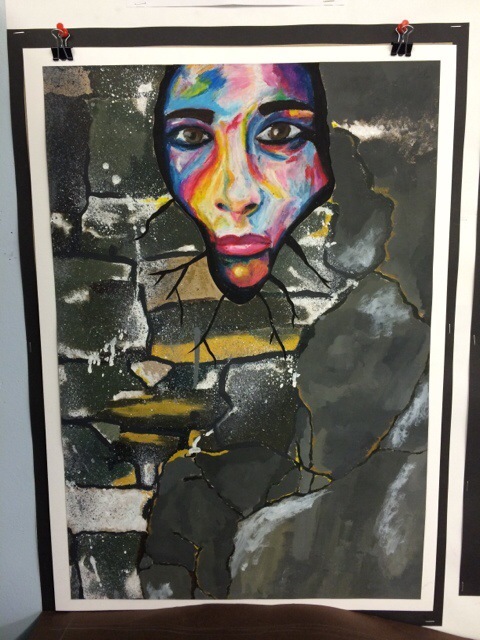 The acrylic painting below was created by Niamh O (S4) for her National 5 Expressive exam. She studied the theme of facial reconstruction and plastic surgery. Although the plan was to draw marker arrows across her face, she decided to leave the marks off so that it didn’t distract from her colour and tone work on the flesh across the face. 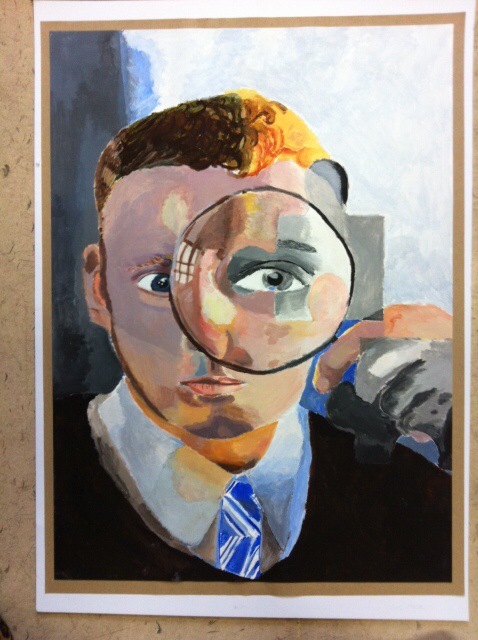 Conor T (S4/Holyrood Secondary) has created this great unit for his National 5 Expressive looking at self portraiture and distortion caused by a magnifying glass. He has used the paint very confidently and stylistically to create a sense of closeness and inspection. We find ourselves examining the subject as he is seen to be examining us. I really like the sketch work on top of the maps on his development sheet. It’s a nice juxtaposition of the idea of examining and it being drawn on paper that may be peered at through a magnifying glass. It also adds a great background pattern for Conor to work on top of. 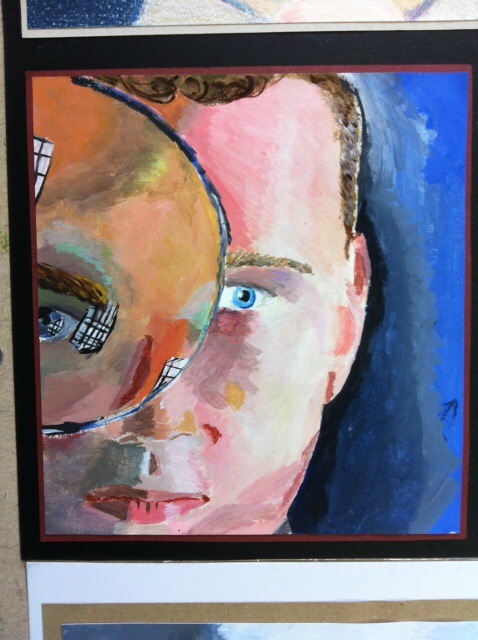 Conor’s final piece is really strong, combining many concepts of audience, of subject and of meaning. 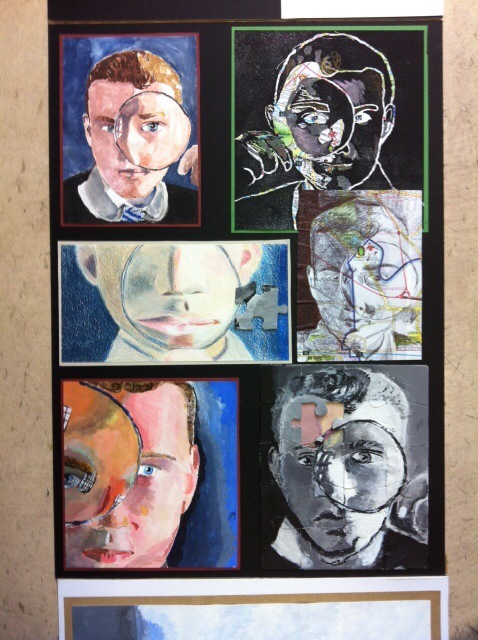 It’s really nice to see pupil work tackle artistic meaning on a variety of different levels. Great Work Conor and a well deserved Artwork of the Week. This beautiful image is Carla L’s (S3/OLSP) final piece for her National 5 Expressive Unit. The face is drawn with oil pastels, while the wall has been created by texture painting, flicking paint using toothbrushes and some undercoating of fine tonal paint. A simple but stunning and thought provoking image. 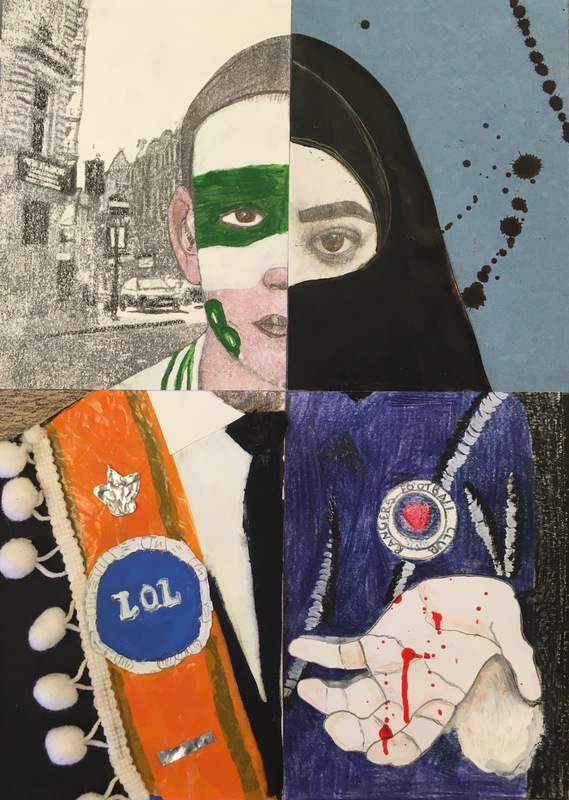 This week’s piece comes from the mind of Kirstie G (S3,OLSP). At first you may not understand it, but continue to look at it… You will soon start to see the fractured image of still life objects. Bottles and vases, jugs and bowls. These are rendered in a variety of media from acrylic and watercolour paints to pencil and charcoal. Some are rushed, some are painstakingly worked on. Each of these works have been completed in full and then sliced apart; artistic vandalism. It was tough for Kirstie to make the decision to do it and to then actually do it, but I think it was the right decision. 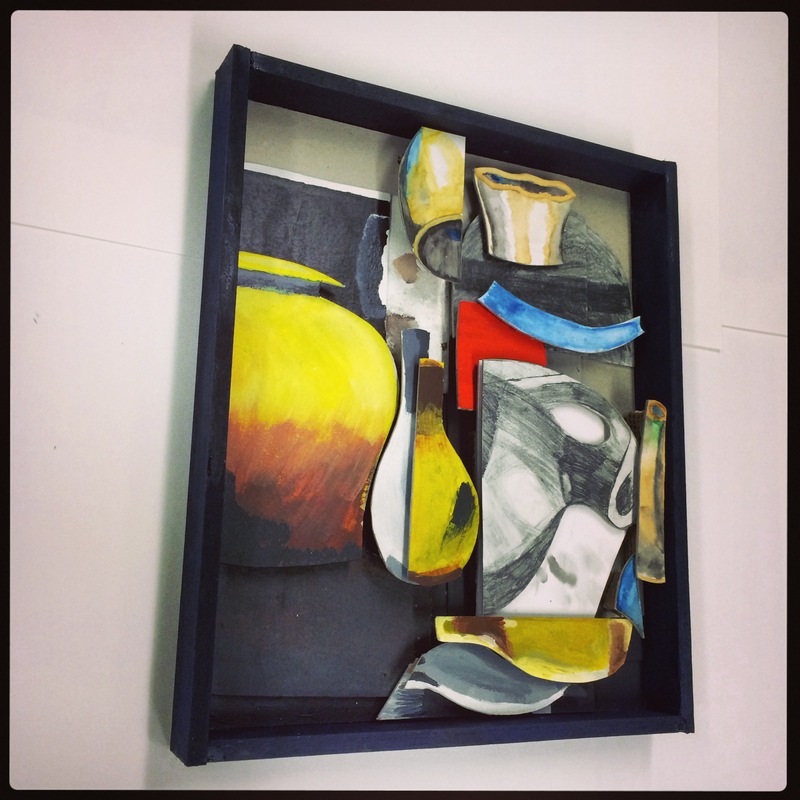 Her work reminds me of the likes of Braque (Picasso’s underestimated co-creator of cubism). Your eye is forced around the work to make sense of it. Little sections are painted well to prove that she can paint. Though that’s not the point. 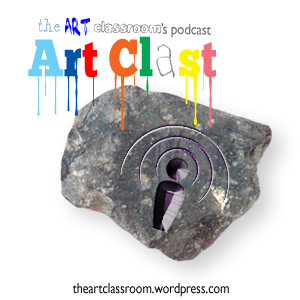 Painting has become snobbish in schools. It’s all about realism and copying. There is little time given to expression and experimentation. It is for this very reason that I feel that this piece is extremely strong. It’s taking chances. It’s not a piece created to pass an exam. It’s created to be a good piece of art and that’s what counts isn’t it? There’s also great aspects of Leger in her work. The lines that dissect the work into a living three dimensional jigsaw. 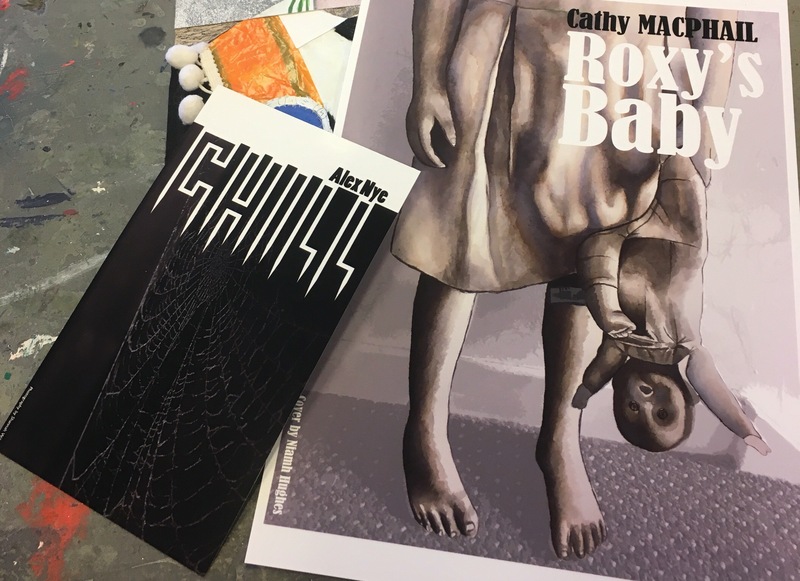 Kirstie’s work is relief, it sits on many levels and the observer is able to lean around foreground objects to view more of the background objects. It’s like four or five paintings in one. 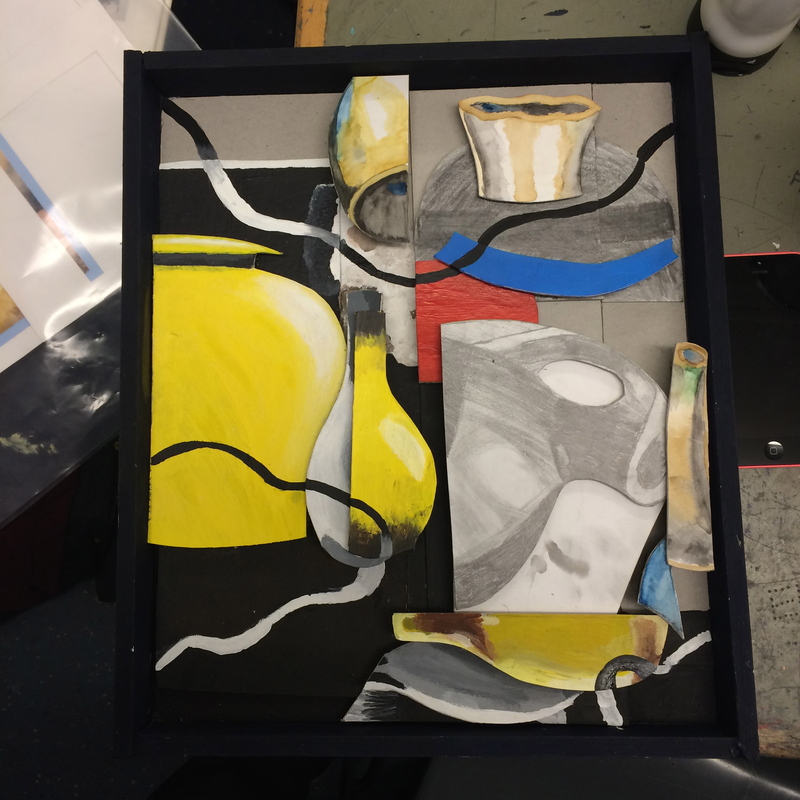 It is just so refreshing to see pupils take on something as hard to understand as abstraction and cubism and learn about it practically instead of remembering about it critically. A well deserved ‘Artwork of the Week’. Art does not always have to be made by artists. I took a class last year in which a lot of pupils who did not like art, had to experience it as part of their ‘Curriculum for Excellence’. One pupil had asked to have the chance to write a book, and so we came up with the ‘Book Sandwich’. The project involved a series of individual art books based on a painting or photo which was sandwiched between two bits of card.